Commonly used to force windowed modes, custom specific resolutions or certain hidden settings. Many games and software exposes certain parameters and options for command-line use to allow developers or users to configure the application in a certain way directly at launch, without requiring what might otherwise be rather cumbersome ways to do the same thing. This is often used to enable or configure settings not exposed through the built-in configuration menu of the application, or to load specific configurations (such as benchmark runs, listening servers, etc). While many command line arguments might be the same across multiple games, these are often the result of using the same engine or similar internal naming schemes among separate developers. An application only supports the command line arguments it have been developed to support, and ignores those it does not recognize how to handle. Supported command line arguments must either be revealed by the developer or found by users by data mining the application. 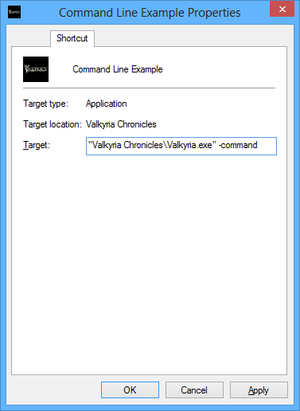 One such way of finding supported command lines involves using Process Explorer to extract all found strings of the executable and then going through those to find and test what might be applicable as an argument, parameter, or option. -fullscreen, -windowed, or a variation thereof to specify display mode to use. -resolution, -width or -height to specify resolution to use. -console to enable the built-in console if the application have one. Follow the instructions for the desired environment. For generic Windows desktop shortcuts. Create a new shortcut, then Right Click on the shortcut and choose Properties. Under the Shortcut tab, find the Target field. Write any arguments after the quotes, then click OK.
Use the Arrow Keys or End to get the cursor at the end of the path. Push Space if more spaces are required, right after the quotes. Open the Library, then Right Click on the desired game and select Properties. Click on the Set Launch Options button located at the bottom. Write any arguments in the text field, then click OK. Right Click on the game's title and select Settings. Fill the checkbox next to Add command line arguments. Write any arguments in the text box. Open the Library, then Right Click on the game's box art and select Game Properties. Write any arguments in the field box, then click Save. Open Games tab on the top-left menu, then select a game by clicking on it. Select Properties on the menu below Play button. Click on Add launch arguments button at the bottom of the page. Write any arguments in the text field, then click Save button. Select Options on the menu below the game's title. Select Game Settings on the drop down menu. Tick the Additional command line arguments radio button. Write any arguments in the text field, then click Done button at the bottom of the page. This page was last edited on 11 November 2018, at 08:29.